Since my girls received their scooters it has been their favourite thing to play on when we go outside. Alice always asks if she can take her scooter to the park in town where there is so much room for her to scoot around. I’ve always said no, because I know that whilst we are there she will want to go in the park and I can do without the added stress of watching her scooter as well as watching two children. That is until now! 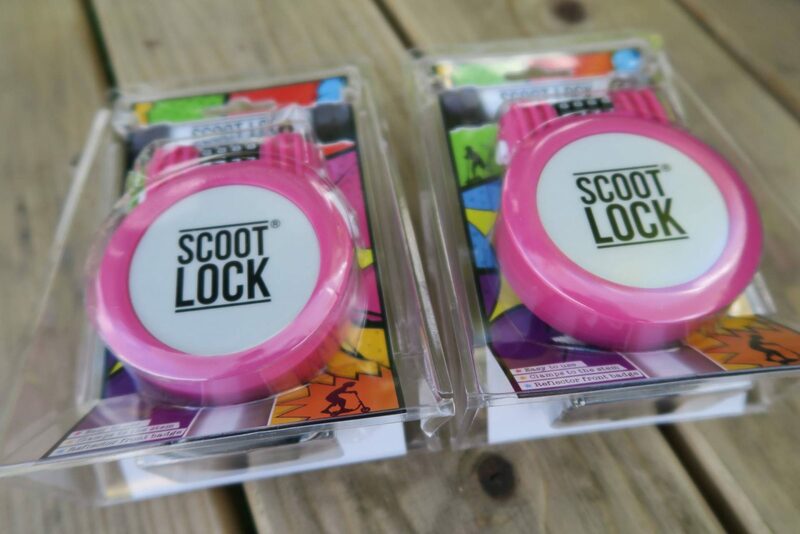 We were recently sent two Scoot Locks for the girls scooters. 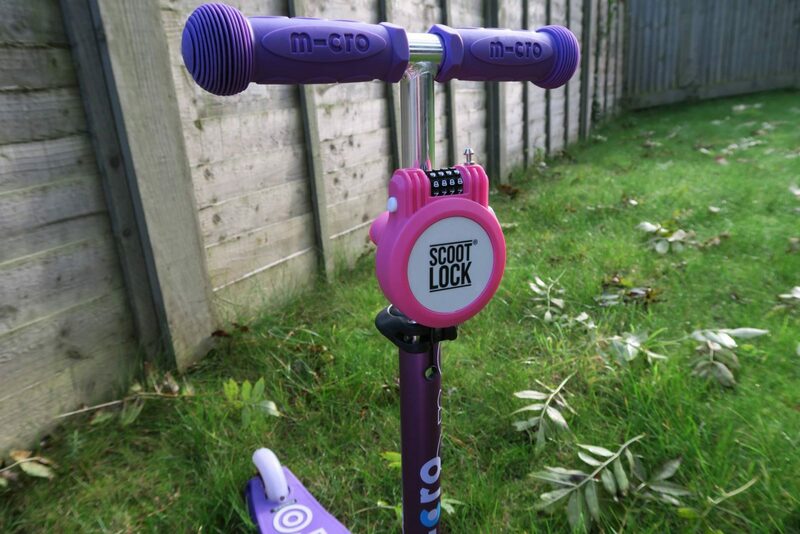 Scoot Lock is the brain child of a mum who invented Scoot Lock when her son’s scooter got stolen. 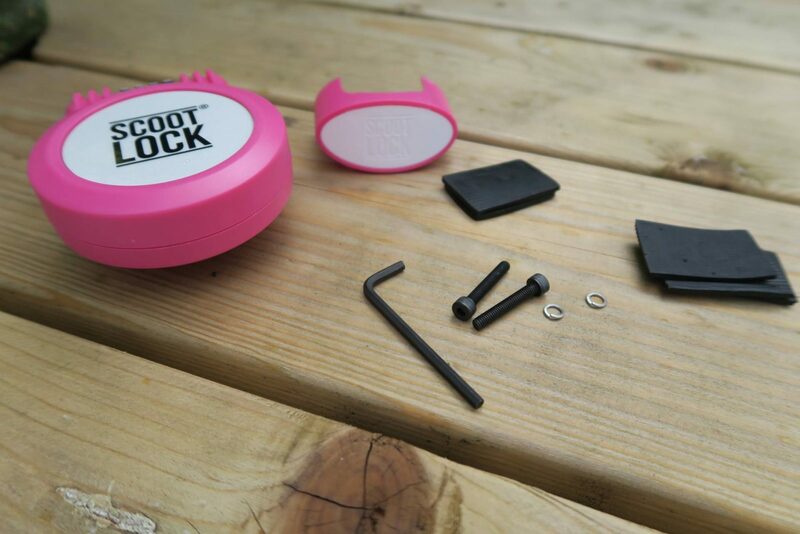 What makes Scoot Lock unique and sets it apart is that it stays attached to the scooter. There is no need to worry that your child (or mummy!) is going to leave it at home. This is a dream for me as with everything else I have to remember to take when we leave the house, this is taken care of. The Scoot Lock was really easy to fit, I managed it by myself. You set the code to lock and unlock it and then its ready to be attached to the scooter. Everything that you need is in the pack, including an allen key. There are four buffer pieces to use to fill the gap between the scooter and the lock, because obviously every scooter is slightly different. This means you always get a nice secure fit. You then just screw the back piece on, using the allen key and its ready to go. The girls have a little bag on their scooters and I was still able to attach these. They were quite handy as it meant the Scoot Lock wasn’t as visible and little Holly who is into everything, she didn’t notice it. Bonus! The bit I really liked was the wire that you use to secure the scooter retracts back into the lock when you are not using it. So, its actually really compact when not in use and you don’t have any wire getting in the way. The Scoot Locks have been the perfect addition to the girls scooters and it has given us even more opportunity to use them. They would make an ideal christmas present for anyone with a scooter. 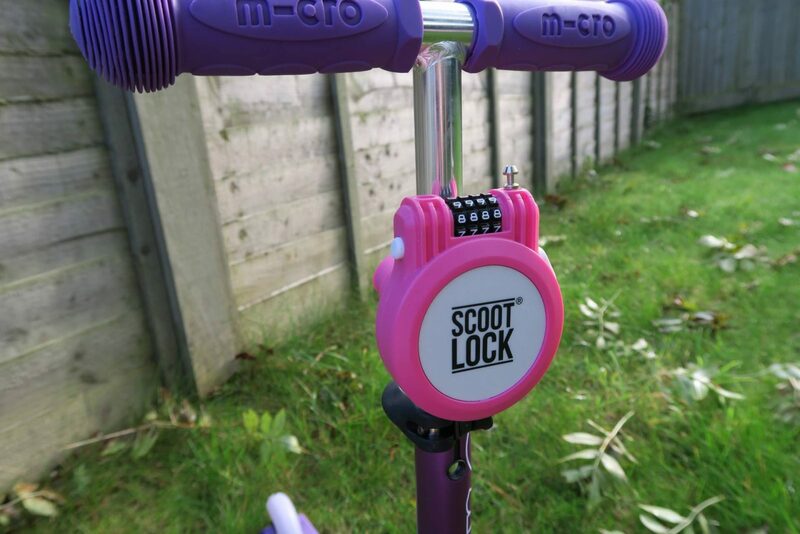 If you would like to purchase a Scoot Lock, they are available to buy over on the Scoot Lock website. They come in five colours and are priced at £19.99. Disclosure: We were sent our Scoot Locks in return for an honest review. All views and opinions are my own. This is such a good idea. I want to buy a job lot for all the children at Libby’s school that leave their scooters unlocked. I’m so worried they’ll get nicked! What a wonderful idea! Max is just starting to get into scooting, but I know so many people who’ve had their stolen from outside school / the park, that I’m wary of taking it anywhere apart from our local skate park. This would put my mind at ease so much! I would like to win for my son, this would be great for when we take his scooter on holiday. Wow, what a brilliant invention!! I am always cautious of taking Oliver’s scooter anywhere for the same reason, he doesn’t ride it that often but when he does it’s always to somewhere that results in my being left to look after it (and everything else) while he’s off doing something. Hard to have eyes everywhere sometimes. My Son, he rides his scooter to school everyday so would give us piece of mind to know it was safe. I love the way it’s just there ready and waiting to be used. I have had the same concerns about you when it comes to them leaving their scooter somewhere to go and play in the park! for my eldest, shes three and would be heartbroken if we lost her scooter! I would love to win this for my 5yr old daughter. She loves scooting everywhere but often I ask her to bike instead as I’m scared of her scooter getting stolen. This is just genius. I would love to win it for my son, so that we are able to leave his scooter at school during the day. Both of my children have scooters and would be devastated if they were lost or stolen, so it would be given to one of them. 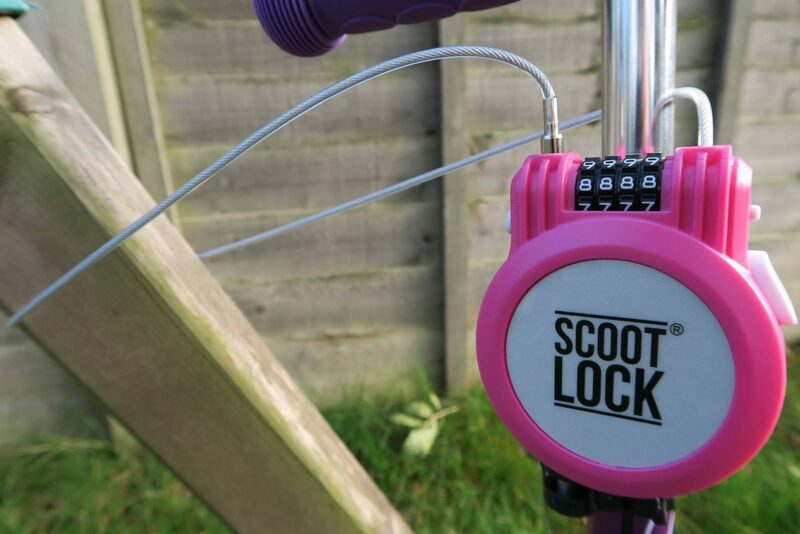 I’d love to win a scoot lock for my daughter. The lock would be for our youngest. Thank you. For my son. Perfect for when he uses it to get to school. 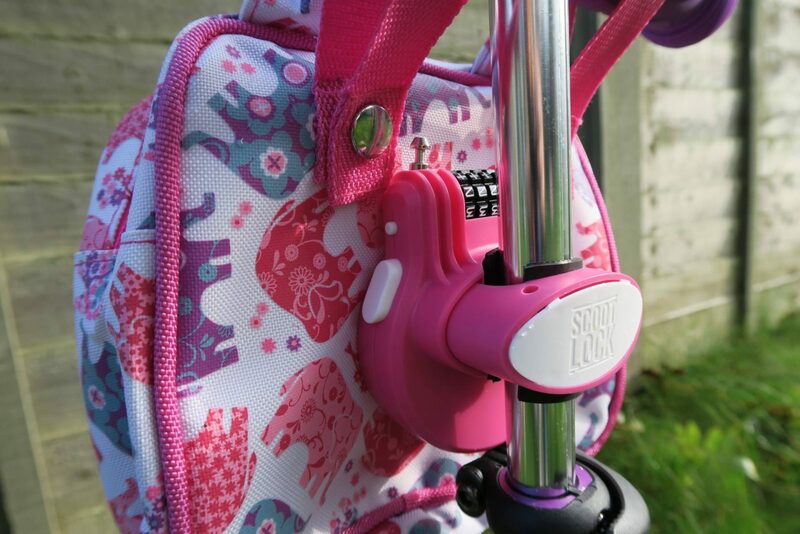 I would love to win one of these fabulous scooter locks for my daughter! my nephew would love this to keep his scooter safe! Would love to win one for my son, he’s getting a scooter for Christmas, so this would be awesome to go with it. My Daughter Jasmine for school.